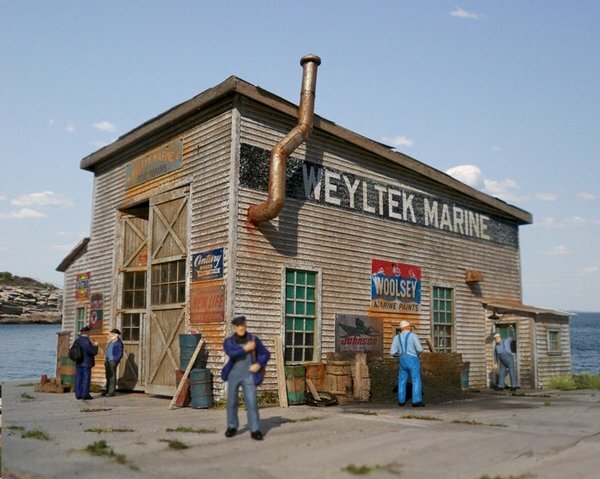 HO-SCALE WELTYK MARINE- Weltyk Marine is a small boat repair shop that can accommodate a 38' boat, or can be used as a small engine house if you desire. This small building will easily fit into your waterfront scene with tons of kitbashing opportunities. The building features metal roofing, three roof skylights, side entry vestibule bump out and a machine shop bump out. The kit features large laser-cut double doors with laser-cut hinges (opening is 2.5" H x 1.875" w), laser-cut clapboard walls, wood and chipboard roof sections, corrugated metal roofing, rolled paper roofing, laser cut sky lights, Tichy plastic windows, detail metal castings and assembly instructions and templates. Building footprint 6" long by 5.5" wide. Figures, scenery and boats not included.